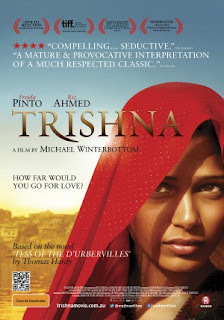 A modern day fairy tale set in India, TRISHNA gives us an eponymous character (played by Freida Pinto, SLUMDOG MILLIONAIRE) not all that different from Cinderella. She catches the eye of Jay (Riz Ahmed), son of a blind hotel magnate who has little interest in following in his father's footsteps. Jay seems to fit the Prince Charming role at first, helping Trishna get a job to support her family after her father wrecks his jeep and can no longer work. At first Trishna and Jay have a friendly, platonic relationship, but as time goes on this Prince Charming slowly reveals a dark and controlling side, perhaps with a violent streak as well. Using Thomas Hardy's novel Tess of the D'Urbervilles as its template, TRISHNA is a tragedy in which the decent, innocent heroine finds herself unable to escape her situation due to the constraints of society and responsibility. Her father resents having to live off the money she makes, but chastises her for quitting her job despite having very good reasons. Jay, who at first seems to truly care about her, first objectifies her, and then reduces her to little more than a concubine. Every time it looks like Trishna will find some way out of her dilemma on her own, some perceived obligation to one or the other of these men in her life, neither of whom warrant such loyalty, pulls her back. The film is written and directed by Michael Winterbottom, who has directed two previous films (JUDE and THE CLAIM) based on Hardy's works. Clearly he finds something in the author's themes about the harmfulness of social constraints that resonates with him, and he does a good job of conveying those ideas on film. Nonetheless there is one problem with TRISHNA, and it is not an insignificant one: there just isn't much to its heroine beyond her beauty and basic goodness. Pinto is such a vibrant presence that she manages to imbue her character with some life, but for the most part she's simply swept along by the plot, enduring her misfortunes stoically right up to the end when she finally takes control in the only way she thinks she can. 3 out of 4 stars.